Get outdoors at Marari Beach and Alappuzha Beach. Give yourself a bit of retail therapy at Pulickattil The Handicraft Shop and Kerala Album Art Gallery. Change things up with these side-trips from Alappuzha: Kumarakom (Kumarakom Craft Museum & Kumarakom Bird Sanctuary). 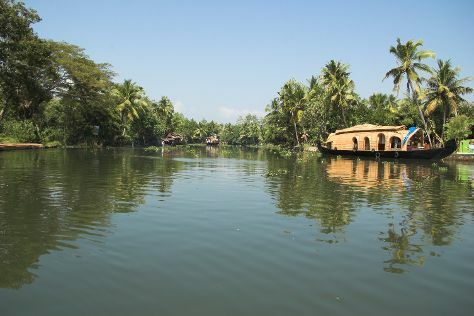 Spend the 18th (Thu) exploring at Kerala Backwaters. There's lots more to do: add some adventure to your tour with a kayaking and canoeing tour, kick back and relax at Mararikulam Beach, and contemplate in the serene atmosphere at Jain Temple, Alleppey. For reviews, more things to do, traveler tips, and tourist information, read Alappuzha trip planner . In April, daily temperatures in Alappuzha can reach 39°C, while at night they dip to 30°C. Finish up your sightseeing early on the 21st (Sun) so you can travel back home.